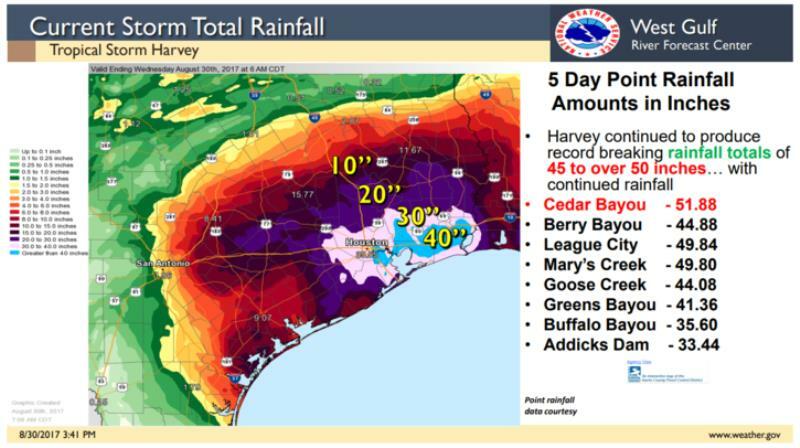 After an unusual event like Hurricane Harvey, it is important to take a look at the forecast, how it evolved and if it verified. On Friday, the WBRZ Weather Team made a forecast for 4-7 inches of rain, primarily for the next week, with little impact to area rivers. The isolated tornado threat was mentioned as well. On Sunday, the forecast was updated to mention decreasing chances of widespread flash flooding and river flooding, noting that some localized issues could still occur especially south of I-10 where isolated amounts up to 10 inches were possible. By Monday, our team pointed out a dry slot that would begin to curtail development of Harvey and rain chances by mid-week despite the track shifting closer to land. Finally, on Monday night, it was asserted that after a heavy burst of rain on Tuesday, improvements could be expected on Wednesday. Overall, the forecast verified nicely with just a bit more rain than expected. Amounts ranged from 3 inches north of Baton Rouge to 8 inches south of the city. Indeed, isolated rain totals high as 10 inches were estimated by radar in parts of southern Ascension and St. James Parishes. There were several reports of street flooding, but not much more than what can occur from heavy summer thunderstorms. Only the Amite River at Maurepas and Tangipahoa River and Robert made it to flood stage, but barely above bank full. For the 13 Parish, 3 County WBRZ Weather forecast area the National Weather Service had to issue 3 flash flood warnings, 3 tornado warnings and 1 severe thunderstorm warning. Especially considering the catastrophic damage that Harvey produced in western Louisiana and Texas, impact to the WBRZ Weather forecast area was low. Unprecedented flooding occurred in southeast Texas and southwest Louisiana. The highest event total reported by the National Weather Service was an astonishing 51.88" at Cedar Bayou. Given this developing scenario and the uneasiness in southeast Louisiana after the events of August 2016, the WBRZ Weather Team made every effort not to over-hype the expected local impact. Our goal was, is and always will be getting you through the storm. We appreciate your patience in understanding this was a volatile forecast, subject to many changes and updates along the way. We also thank you for the many social media likes, shares, questions and comments. In the digital age, a steady stream of information is vital to the success of a forecast. Realize that by sharing or retweeting a message, you may have helped somebody receive a forecast, they may not have seen otherwise. THANK YOU! As for one final forecast of Harvey—do not expect to hear that name tied to a hurricane ever again, unless mentioned in a historic context. Harvey will certainly be retired from the names list during the upcoming off-season.